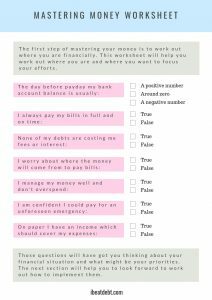 I Beat Debt is pleased to launch its first ever free printable in the form of a worksheet. The worksheet is downloadable in full via this link or by clicking on the preview below. 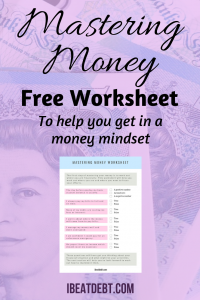 This worksheet is not designed to solve all your money worries and concerns overnight, but it will give you the opportunity to take some time out and think about your financial situation and where you can make improvements. 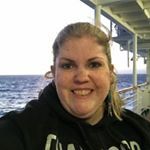 It is designed to be worked through in one go – allowing you to really get in to a money mindset and ideally away from distractions such as work and children. If you have a partner or spouse, you can work through it together. Sometimes money concerns seem entirely overwhelming and this worksheet will hopefully reduce that feeling and allow you to move forward! ← Becoming a landlord – is it a good plan?